The majority of of all Lean Six Sigma corporate initiatives, 60% according to some studies, fail to yield the desired results: many are struggling in turning Lean Six Sigma into a success, citing lack of leadership, changing business focus, internal resistance and availability of resources as the main impeding factors. In the vast Lean Six Sigma literature, there is paucity of studies on the impact of leadership: a lot of the literature is focused more on the technical side of Lean Six Sigma, leaving the leadership and cultural impact aside. 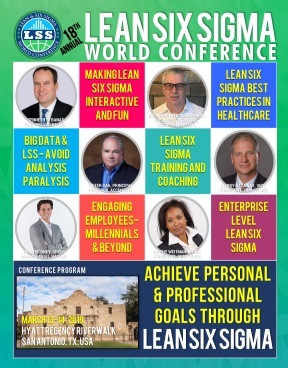 The aim of this presentation is to illustrate the results of research into the Leadership’s impact on the deployment of Lean Six Sigma in organizations and thereby develop a practical framework to facilitate its successful implementation. Leadership is a critical success factors for effective deployment of Lean Six Sigma in organizations: it can be argued the biggest but most unheralded benefit of Lean Six Sigma is its capacity to develop a cadre of great leaders, becoming an effective leadership development tool. Leadership and Lean Six Sigma are dependent on each other for success: the focus of the research has been to investigate deeper into the Leadership’s impact on Lean Six Sigma deployment, to determine whether different styles and traits of leadership can have an impact on the deployment of Lean Six Sigma in organization and on its capacity to sustain itself.